Zion Market Research has published a new report titled “Anti Corrosion Coating Market by Type (Epoxy, Polyurethane, Acrylic, Alkyd, Zinc, and Chlorinated Rubber), by Technology (Solvent-borne, Waterborne, and Powder Coating), and by End-Use Industry (Marine, Oil & Gas, Industrial, Infrastructure, Power Generation, Automotive & Transportation, and Other End-Use Industries): Global Industry Perspective, Comprehensive Analysis and Forecast, 2017 – 2024”. 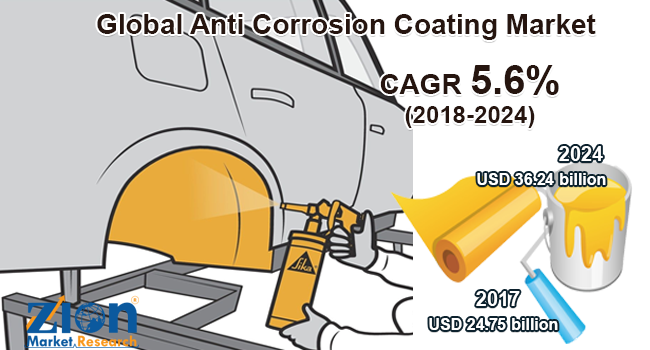 According to the report, global anti corrosion coating market was valued at USD 24.75 billion in 2017 and is expected to reach USD 36.24 billion in 2024, growing at a CAGR of 5.6% between 2018 and 2024. Increasing requirement for anti corrosion coatings in marine, oil & gas, construction, power generation, and other industries are anticipated to positively impact the market growth in the forecast period. The rising investment in infrastructures in the construction and transportation sectors in the emerging economies is the major key factor driving the market growth. The fluctuating prices of crude oil may hamper the growth of the market. The manufacturing companies are focusing on inventive products thus anticipating to open a new opportunity for the market. The Asia Pacific was the leading market for anti corrosion coatings in 2017. In terms of value and volume, Asia Pacific was accounting for above 35% share in 2017. It is expected to witness increased demand for anti corrosion coating due to the rising positive regulations in the region. In 2017, North America was the second largest region for anti corrosion coating with around 23% share followed by Europe which was expected to hold around 18% market share. Furthermore, the changing dynamics, government favorable policies in the region is expected have a positive effect on the demand for anti corrosion coating in the region.